The conventional wisdom is that pocket carry should be avoided if at all possible. It's better to carry in or otherwise on the waistband if one can help it, or so the refrain goes. It's closer to the truth to say that pocket carry - if done right - is a perfectly viable method of concealed carry. How does one pocket carry correctly? Here are the tips and tricks you need to know. First and foremost, you need a pocket holster. If you don't do anything else that's mentioned in this article, you're already head and shoulders above a lot of folks that are taking silly chances with their safety. After all, a holster is a piece of gun safety equipment as well as a means to carry a pistol. A proper holster ensures your gun is kept safe. A pocket holster is of vital importance for two reasons. First is to protect the trigger. Nothing should be allowed to touch the trigger as a tiny snag is but a step or two removed from an unintentional discharge. Do a Google search for "accidental discharge" or "negligent discharge" and you'll soon find a number of instances where a snagged trigger caused a pistol to discharge a round when the owner was pocket carrying without a holster. The most popular pistols of today are slim, subcompact striker-fired pistols with light triggers that have only a passive safety. It isn't that they are unsafe, but rather that they require the trigger to be protected at all times to ensure safety. Carrying with the trigger guard exposed is taking chances with not only your safety, but that of those around you. That is never acceptable. Next is to ensure a proper draw from concealment. If you conceal and carry, you have to be able to get your gun into the fight. 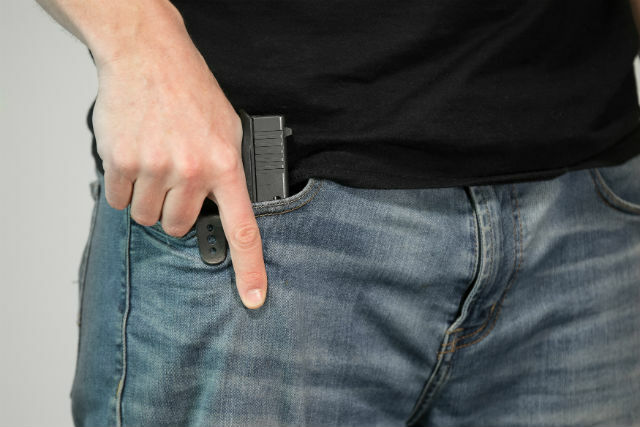 Without a proper concealed carry pocket holster, you're liable to snag the sights or other contours of the gun inside the pocket, which defeats the purpose of carrying a gun in the first place. Another aspect of pocket carry of vital importance is to practice the draw. This idea, of course, applies to carrying a pistol in any position no matter the concealed carry method, so you should do so no matter what. So, what are the pointers? Carry with clothing that is conducive to being able to draw the pistol. You want roomy pockets, because you'll need to get your hand in and your gun out in a hurry both on the range training as well as in the moment of truth. Slim-fit or Italian cut suits are out. Pants pockets should come up to the wrist when the hand is fully inserted, and - when devoid of your gun - should be a bit roomy. When trying on pants, make sure you sit down with them on. Can you get your hand inside the pocket while seated? If not, they aren't the best choice. A little difficulty is to be expected, but you need to be able to. Try to select pants that have a wide mouth to the pocket, as the rear sight is liable to hang up under the rim of the pocket on the draw. If the gun doesn't come clear when it matters, you can end up in a world of hurt. Make sure that your gear works before you hit the streets. Your pants need to work with your gun if you're going to carry with a pocket holster. Legendary/infamous Chicago lawman Frank Pape carried multiple pistols in case he needed a New York reload. He had a tailor sew longer pockets into his pants so he could put a Police Positive in each pocket, and a couple of snubbies in his jacket pockets. Likewise, you need to select pants or a jacket that will allow you to get purchase on the gun and draw easily. Another tip is to select a pocket holster with a pocket catch. Usually it's a little wing on the holster, which catches inside the pocket and lets the gun come free. Old-school leather pocket holsters will have them, but so will modern pocket holsters of good design. There is a technique to the draw as well. The fingers on your drawing hand should be extended fully, including the thumb which should be flat against the side of the hand. This is to ensure the hand slides quickly into the pocket. The hand should ride against the pants, sliding into the interior side of the pocket instead of being jammed into the opening. That ensures your hand glides right in instead of potentially hanging up. Good purchase should be obtained on the pistol and drawn out smoothly before presenting the pistol. Reholstering...is another matter. You may not be able to reholster as efficiently as with holsters at other positions, but if the holster remains in the pocket you may be able to do so fairly well. At the range training or in the home, it is of vital importance that you holster the gun OUTSIDE the pocket. Holster the gun and THEN insert into the pocket. A few other things to know about pocket carry and some other tips that can be helpful include making the right choice of pistol. Granted, this is the most obvious, as slim single-stack subcompact semi-autos like the M&P Shield or Glock 42 are the best fit. However, pocket carry started with revolvers and today there are some very good snubbies for the purpose. The Smith and Wesson J-frame family is a natural fit, though you may wish to consider the DAO or shrouded hammer models - such as the Model 642 - in lieu of the classic guns. The Ruger LCR is also a natural fit for this role. In fact, plenty of people carried a brace (or in the case of Frank Pape, even more!) of snubby revolvers in pockets. If you intend on carrying your reload wrapped in another gun, this is a method to do it with, for revolvers or semi-autos. Pocket carry is best done in the front pants pocket, a cargo pocket or in a jacket pocket. Wallet carry can be done but will be harder to access. It is also wildly uncomfortable when sitting. Some people carry their primary CCW pistol in this fashion, others carry their backup gun in a pocket holster. Others only carry in the pocket on occasion, such as in winter time when accessing a waistband holster is problematic. That aspect is up to you. However, you need to make sure that pocket carrying is effective for you. You should be confident of carrying safely and concealing effectively. That said, you also need to make sure that you're able to get to the gun if needs be. Otherwise, it's effectively a paperweight in your pocket. With the right choice of gun, holster and with a little practice, though...pocket carry with a holster is definitely a feasible concealed carry method.